While not all of us may have the cash to afford such things, there are many out there who like to use Intel's HEDT platform for gaming. I myself tend to use Intel's HEDT CPUs pretty often, and while their high core count and slightly lower clockspeeds compared to mainstream platforms might not be what everyone is after, when you do stream your gameplay, encode videos, or do other multi-processing tasks that can make use of all those cores, HEDT builds are definitely drool-worthy. 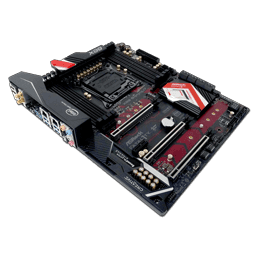 Enter ASRock's Fatal1ty X99 Professional Gaming i7. I think I've said it often enough: I take gaming and gaming-related products pretty seriously. I am sure many of us do, yet not everyone reads online forums and engages in typical enthusiast behavior, so it's important to me that products that carry the gaming moniker work well and are built to last. My 15 year-old son spent all summer working so he could afford his gaming "needs", and like anyone else, you want to make sure you get exactly what you need when spending that money so that those long hours working to pay for it weren't for nothing. ASRock is ready to make sure you get exactly what you are looking for. ASRock's Fatal1ty X99 Professional Gaming i7 carries on with a tradition of carrying features tailored for pro gaming, chosen by Fatal1ty himself. That's what I love about ASRock; they take real people who do real things and ask them what they need to then build it. ASRock's OC Formula line is no different, carrying Nick Shih's signature touch. So what we have here with the Fatal1ty Professional products is a similar treatment as with ASRock's OC Formula line, geared toward pro gaming rather than overclocking. What does a pro gamer who wants Intel's HEDT platform need these days? Let's find out.